Pew Research Center surveys and independent analysts have found that roughly one-third of all American adults – and about half of smartphone owners – have an Android smartphone. All apps for Android phones are housed in the Google Play Store, and each app has its own web page where information about the app is available. Each web page includes basic descriptive information such as what type of app it is; how much, if anything, the app costs to download; the app’s content rating; and what information or other permissions the app requires from users. To collect information on these apps, Pew Research Center scraped each app’s page in the Google Play Store using the Chrome browser and a custom browser extension. The extension copied all of the information on each page and stored it in a database for later analysis. The data collection was conducted from June to September 2014, and captured information of about 1,041,336 unique apps (see the Methods section for a detailed description of this process). Pew Research Center elected to study the Android ecosystem for two specific reasons. First, information about apps in the Google Play Store is freely available on the Google Play Store website and therefore easily aggregated. Second, the Google Play Store publishes information about app permissions along with the other metadata, and the issue of permissions is a key focus of this research. Other platforms, such as iOS (Apple’s mobile operating system), are more challenging for outside parties to access, and they handle the process of informing users about app behavior differently and in ways that are considerably more complicated to analyze. 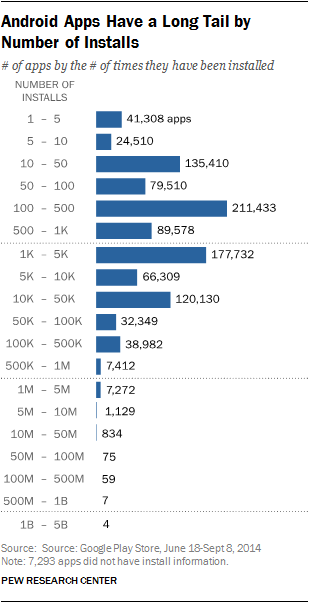 For these reasons, only apps within the Android ecosystem in mid-2014 are included in this analysis. It should be treated as a study of one app ecosystem and how it handles informing users about how their information is being collected and used. Moreover, the situation in the Google Play Store has changed somewhat from the time these data were collected and the permissions regime that exists for those who now want to install apps on their Android phone. As noted above, the Android operating system was changed this summer when Google announced a new feature in the next version of the Android operating system. This new feature would allow users to turn off certain permissions on an app-by-app basis and to see all of the apps permissions in a single place (sometimes referred to as a “permissions dashboard”). While this change will be significant when it is fully available, it is still built upon the existing structure of permissions. Overall, eight categories of apps (Education, Entertainment, Personalization, Tools, Lifestyle, Books and Reference, Business, and Travel & Local) comprised more than half of the apps available for download (53.58% in total). Music apps were the least prevalent category, comprising just 668 apps — or 0.06% of the more than 1 million total apps in the Store. 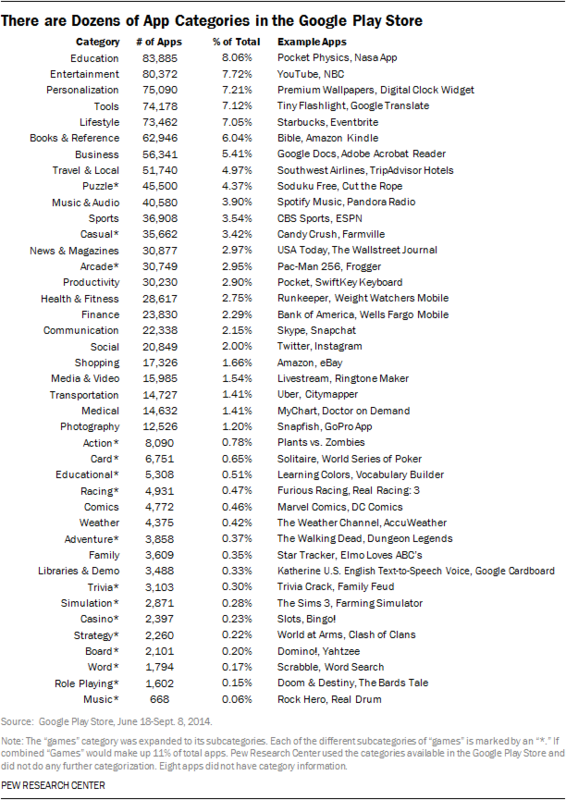 When collecting this app data, Pew Research Center used the categories in the Google Play Store and conducted no additional categorization of the apps in the dataset. Indeed, four apps were downloaded between 1 billion and 5 billion times as of September 2014 — Google Maps, Gmail, Google Play Services and YouTube. It is important to note that all four of these apps, however, are required downloads for all Android devices. Put another way, users did not necessarily choose to download these apps, they came preloaded on their device (or at least users were prompted to download them automatically when setting up their device for the first time). 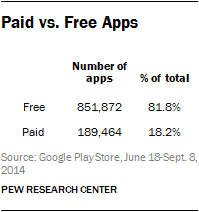 In the next group of most downloaded apps, there are two that are not required by Google. Seven apps — Facebook, Google Play Books, Google+, Google Search, Google Text-to-Speech, Google Street View and WhatsApp — had been installed between 500 million and 1 billion times as of September 2014. Of those seven, Facebook and WhatsApp (a messaging app owned by Facebook) are not Google apps and are not required installs on Android devices.9 Google did relax its pre-installed app requirement somewhat in August of 2015 when the firm removed Google+ and Google Play Books from the list of required apps.10 The main reasons apps stay updated are to keep up with Google updating the Android operating system and to deliver new features to their users. With half the apps not updating at all in 2014, it is clear that many apps are not trying to keep up with this process or are simply not being used.